Boozy hot chocolate cookies! 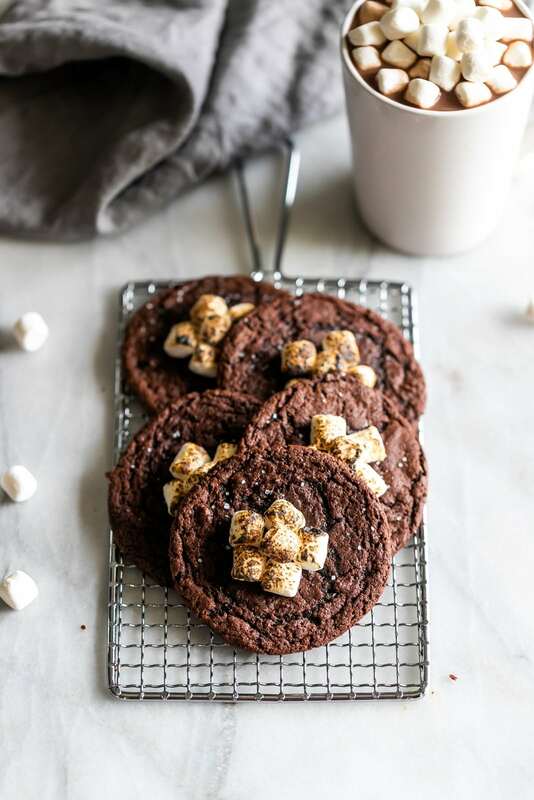 Rich, soft, and chewy chocolate cookies spiked with your favorite liqueur and topped with gooey torched mini marshmallows. You know when you make hot chocolate and you add mini marshmallows on top? That’s basically what these cookies are. They are a hot chocolate drink in cookie form and I’m so here for it. 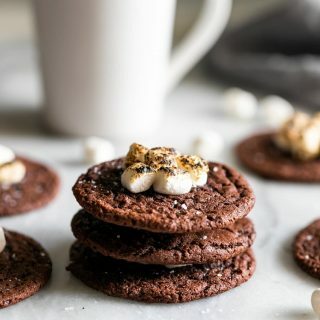 These boozy hot chocolate cookies could not be more rich and chewy. The hint of booze also adds to its scrumptious flavor. Whether you add hazelnut liqueur or bourbon, you’re in for a cozy treat. My only regret is not adding more mini marshmallows, honestly. Now, I’m sure you’re wondering if these cookies are strictly “adults only”. They’re not. Booze actually burns off while the cookies bake in the oven. But if you feel strongly about not adding any alcohol, you can totally omit it and they’ll still taste just as delicious. Guys, I mean these are so easy to make and so addicting that you may end up making them every week this month. I’m not responsible for cookie comas. Ok! So…here”s how you make them. Mix butter and sugar in a bowl. Add egg and liqueur, and then mix in all the dry ingredients – flour, cocoa powder, cinnamon, baking soda, baking powder, and salt. It will look like wet dough which is exactly what you want. I used this cookie scoop to form the dough balls. Once you scoop the dough, you roll it into a ball. Using a cookie scoop makes all the cookies the same size. 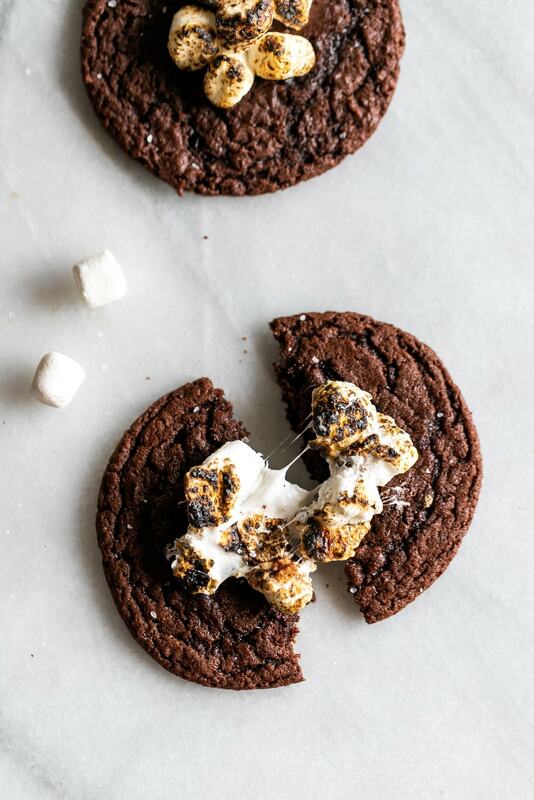 The cookies bake for 10 minutes and then you add the marshmallows on top while the cookies are still ooey gooey. That way they slightly melt into the cookie. I torched these marshmallows with this kitchen torch but you can also place them under the broiler for less than a minute to get them nice and toasty. Adding a pinch of sea salt makes this the perfect salty sweet cookie. Also, pro tip… a glass of milk with these hot chocolate cookies would not be a bad idea. 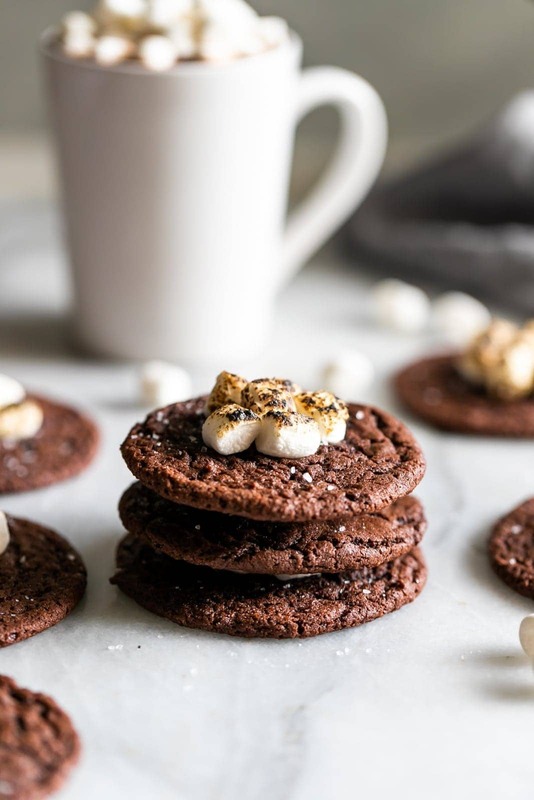 Can’t wait for you guys to make these boozy hot chocolate cookies! In a mixer or large bowl, mix butter and sugars together. Add egg then stir in the liqueur. Add flour, cocoa powder, cinnamon, baking soda, baking powder and salt. Mix until mixture is a wet dough-like consistency. Form dough balls using a cookie scoop and place on the baking sheet. Bake for 10 minutes. Remove the cookies from the oven. They will be a little undercooked and that’s ok. They finish cooking as they cool. Top each cookie with 3-4 (or more) mini marshmallows. Gently push them into the cookie so they melt a bit with the heat. Place the cookies under a broiler for 30 seconds or slightly torch the marshmallows with a kitchen torch until they are nice and toasty. Transfer cookies to a plate to cool. Garnish with sea salt. Enjoy!